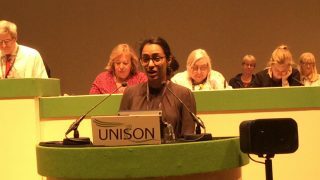 The brave battle of UNISON’s health members against NHS outsourcing was brought into the spotlight in Brighton last week. 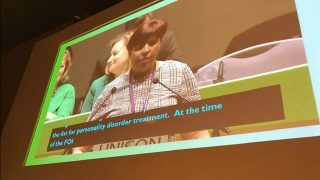 Some of the Wigan hospital cleaners, catering staff and porters who are striking against plans to transfer them to a wholly owned subsidiary were applauded by the national delegate conference, where they were awarded £5,000 from the branch hardship fund. 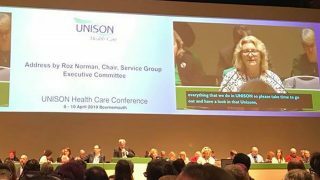 Delegates also approved a motion calling for a national campaign against the arms-length companies that the union believes will create a two-tier workforce and could lead to back-door privatisation of the NHS. More and more NHS trusts are seeking to set up arms-length companies as a way of exploiting a VAT loophole and reduce their operating costs. These companies carry out estates and facilities work on a contractual basis. While members are TUPEd, UNISON believes they will be vulnerable to attacks on their terms and conditions, with new staff employed on inferior terms. 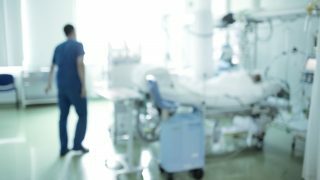 Hundreds of hospital workers in Wigan, Leigh and Wrightington in the north-west of England have held two 48-hour strikes against the plans to outsource them. “We are fighting to stay part of the NHS,” Hazel Leatherbarrow, told delegates. “We all do important jobs. We are one team and we want to stay as a team. Ms Leatherbarrow said that the trust had given assurances that 900 staff being transferred would have 25 years’ protection under TUPE regulations. The result would be a two-tier workforce and “a recipe for chaos”, he said. One speaker said the trusts were “making savings off the backs of our members” and were using wholly owned subsidiaries to undermine national agreements and access to pension schemes. Another said that the new companies “are taking us back 25 years and beyond”. support local branches involved in campaigns.